Orders containing this item will not ship until May 03, 2019. 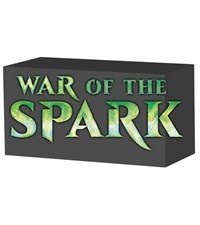 The War of the Spark Deck Builder's Toolkit is a box set that will be released on March 3, 2019. It contains 100 basic land cards, 125 fixed cards suitable for improving the set's Planeswalker decks, and four 15-card booster packs . You also get a deck builder’s guide with tips about building the best Magic decks, a Magic"learn to play" guide and a full-art reusable card storage box.